In recent years, the ability of a YouTuber to influence people has blown out of proportions. From deciding which smartphone to buy, to even planning vacations, people from different part of the globe have turned to YouTube to have their queries answered. The creators who are the life and blood of YouTube have also grown along with it. They have grown not just in terms of views and subscribers, they have also become stupendously wealthy by smartly turning their online influence to wealth. From Youtube ad monetization to direct paid partnerships with brands, YouTube has not just made it easier for creators to get global visibility, they have also made it easier to monetize their millions of views and subscribers. While all of this might sound hunky dory, what are the odds of becoming a successful YouTuber in 2018? Not that great! While there are many ways to get Youtube subscribers, about 97% of people who start a channel this year on YouTube will still fail to make any money from it. In addition, the fact that there are only so many viewers on earth makes it a limited playing field. Legendary YouTubers like Casey Neistat and Pewdiepie grew to be at the level that they are in through years of hard work. Casey famously quotes that it took him 5.5 years to reach his 1st million subs milestone on YouTube. But one YouTuber has slowly been breaking all the traditional beliefs about being a YouTuber. After just a year of becoming a Full Time YouTuber. The Toronto based photographer and videographer now has 1.8 Million YouTube subscribers. A number that most can only dream of. In fact, he reached his first million within 9 months. Compare that number with Casey’s 5.5 year journey to a million subs and you will know how special this story is. So, what is his secret to success? Of course his energy and passion for making videos play a big part. But, Peter owes a lot of his success to his content strategy. It’s pretty impressive how he came up with an epic formula for success on YouTube being a beginner himself. Peter’s content strategy can be dissected into 6 Pillars. These 6 Pillars ensure that he has a one up over all other content creators. Peter has a very strong understanding of what works and what doesn’t on the YouTube platform. Having personally tested all types of video content on YouTube including Vlogs and Motivational videos, Peter has now arrived at the perfect formula for achieving YouTube stardom. After his first year on YouTube, Peter had uploaded 180 videos. Like every other beginner on YouTube, his initial videos didn’t get a lot of traction. But Peter is not the type of guy that waits around hoping that one of his videos goes viral. He started testing different types of content on his channel. His first success came from a listicle. This video gave him validation that he was going in the right direction. He continued on his growth trajectory with video Tutorials which were mostly about Photography and Videography. With such tutorials, he is truly able to deliver value to the viewer. And as you know, value attracts subscribers. These type of content ensured that there was a high shareability quotient attached to all of his videos. This got him phenomenal traction right from the start. Unlike Buzzfeed that throws listicle after listicle at our face till we get bored, Peter has however ensured that he has kept experimenting with a mix of Vlogs, How-To-Videos, motivational videos and gadget related videos. By experimenting different types of content formats even you can arrive at a winning content formula. As Peter mentioned in his “First year on YouTube” video, he has created 180 videos in the last 365 days. This means that he released one video every two days. As a subscriber myself, I can say that he follows a consistent schedule that he follows no matter what. You can usually see Peter uploading 3-4 videos every single week. When you follow a consistent schedule, you build a relationship with the viewer. The viewer builds a habit of watching your videos at regular intervals. The keyword here is FOMO - Fear of missing out. Viewers get so invested in your channel that, they subconsciously get a feeling like they miss something in their life if you don’t post a video for a day. This is one of the main reasons why Casey’s daily Vlog series was a big hit. This particular pillar is something that sets Peter apart from other YouTubers. His lifelong experience as a videographer and photographer has given him an edge. Every frame that you see in Peter’s videos look like it’s out of a photography album. He is also the best when it comes to Lighting and Audio quality. Just have a look at this motivational video. With his simple equipment, he is able to create a cinematic experience. Peter never waited for viewers to find his videos organically. In one of his collab videos, he explained that he made a huge list of all the websites that reposted articles, blog posts or videos (The ones that mainly talked about creating content online) and sent his YouTube video to around two hundred different websites throughout the day. Eventually one site posted it, then two and then it just exploded. If you are a new creator on YouTube, creating a content promotion strategy can be vital to your success in the initial days. So, make a list of websites which have visitors that might be interested in your content and start reaching out. In recent years, collaborations between influencers have seen a rise. It makes a lot of sense as it usually results in a spillover of followers and also attract new followers. It usually results in exponential follower growth for both the collaborators. Peter is known to collaborate with a lot of other YouTubers. He collaborates with YouTubers who are both bigger and smaller. Here’s one that really caught my attention. When YouTubers do a collab, there are usually two versions of the same video. One from each of the collaborators. Below is Casey’s version of the same video listed above. These videos create a bridge between both the channels. Together these videos crossed over 2 Million views which really shows that collab videos can easily get a lot more visibility than individual videos without any promotion. One other thing that helps Peter make a strong connection with his audience is his ability to be authentic on camera. Instead of following a premeditated script, Peter speaks from his heart. Though these videos gave him a lot of traction, he later decided to discontinue the series and there was a strong reason behind it. Peter wanted to convey that to his concerned followers that had started enquiring about the series on Twitter. So he made a video where he can have a heart to heart conversation with his viewers. He says that he thought of the ‘Two minute Tuesdays’ series because he wanted to make a video every single week for only two minutes and it could be about anything he wanted. Peter also explained that he thought it would be an easy and consistent way to keep making content. But things didn’t go according to plan. It started out with one tutorial, then there was another tutorial and soon people started to assume that Two minute tuesdays was a video series where Peter would teach about videography or photography. But that was not why he started the series. So he decided to go in front of the camera and let his followers know how he felt about it. This heart to heart confession made him a favorite and built him a strong following. This among others is his strongest pillar. Combined with his Light hearted humor and likeable personality, he has started to become YouTube’s favorite creator. Along with these 6 Pillars, Peter also follows a few Tiny hacks that gets him results. In most of Peter’s tutorial videos, he tells viewers what they are in for, during the first 20 seconds. This happens even before his intro reel starts playing. By letting people know how he’s going to help them, he sets expectations in the beginning itself. This makes sure that they stay longer! If you guessed ‘Attractive Thumbnails’, you guessed right. But YouTube’s general rule for thumbnails doesn’t seem to apply to Peter’s channel. Instead of images with Bright and Huge click baity title, he uses images that are pleasant on the eyes. His skills in photography seem to come in handy too. Titles along with the thumbnails play a major role in hooking in new viewers. More than a hack, I see this as a rule that Peter follows universally for all his titles. Peter’s Title rules ensure that his titles are super attractive but at the same time do not enter into Clickbait territory. Yes. It is true that Clickbaity titles can maximize the number of clicks and views you get but what image does it paint in the minds of viewers? Will it make you look like an attention seeking YouTuber or will it make you look like a person that is genuinely trying to help viewers through their channel? Plus, most of the videos with Clickbaity titles end up disappointing the viewer because of their inability to live up to the hype created by the title. This rule ensured that Peter’s viewers always felt content with the value that the video offered. 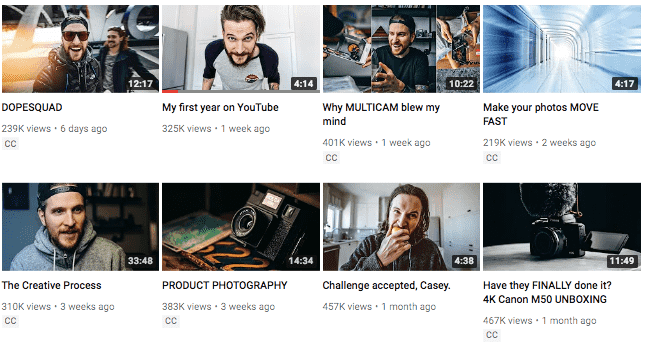 These Pillars and hacks really prove that Peter might already be among the creme de la creme of the YouTube creators community in terms of content strategy. It’s only a matter of time before he goes on to top the list. If you are still thinking about starting out as a YouTuber. Stop thinking! Just do it. If you are already a YouTuber but you are not getting enough subscribers. Go ahead and try out the plan that made Peter what he is today! If you are worried that your content won’t meet quality standards, Don’t be! The first version is always bad. You will eventually arrive at ‘Awesome’. Here’s a snippet of what Peter thinks about the creative process. “If you don’t fail, you are not doing it right! If nobody ever made mistakes, life would be really boring! Have I missed out on any other strategy that Peter Mckinnon follow to increase subscribers? Let me know in the comment section below!